Sorry to post another picture of myself. No, I’m not. I love it. Anyway, you may recall my small involvement with the group devoted to memorializing the 99th Infantry Battalion (Separate), the commando battalion recruited from Norwegian expatriates and Norwegian-Americans during World War II. 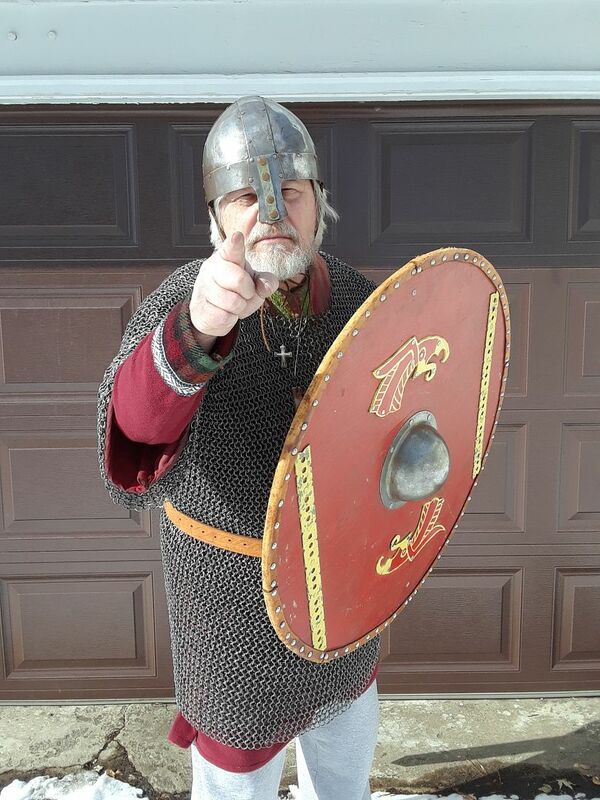 I was recently asked to be their “spokesviking,” and they asked for some pictures of me in my kit, in the James Montgomery Flagg “I WANT YOU” style. I meant to get photos taken during our reenactment group’s Viking feast last week, but the forces of nature made that impossible, as is their wont in these parts. So I got a friend over to take some yesterday. Here’s one. I sent several off to the 99th people, and I’ve seen a preliminary mock-up of what they’re going to do with it. It’s pretty cool. I look forward to sharing the finished product. A while back, I blogged about a recent article declaring that a Swedish Viking warrior’s grave, long assumed to be male, was probably that of a woman. I cited Judith Jesch’s critiques of the article, which she considered over the top and under-authenticated. A recent article in in the Journal Antiquity has addressed those objections. Researchers insist that the body in the grave was indeed that of a woman. Now, in a new study published online yesterday (Feb. 19) in the journal Antiquity, the researchers of the original study have reaffirmed their conclusion that this mighty individual was a woman. The new study addresses all the questions people raised, and more. Living Science reports on it here. I have to eat a small amount of crow in this case, but all in all I’ve decided to dig my heels in. I’m suspicious of this story. It doesn’t fit the textual accounts — either the contemporary chronicles or the Icelandic sagas. I keep coming back to my “dog in the nighttime” argument. If Viking armies were full of fighting females, why are the monastic chroniclers silent about it? How could they resist denouncing “unnatural females” and “monstrous witches” in such a situation? So I’m waiting for more information. Ms. Jesch seems not entirely satisfied as well. However, I’ll admit I’m prejudiced. Sofia Helin (Crown Princess Martha) tries to persuade Kyle MacLachlan (Pres. Franklin Roosevelt) to support the Norwegian government in exile, in a scene from Atlantic Crossing. I happened to check the IMDb page for Atlantic Crossing, the coming miniseries I helped translate, yesterday. I found the above picture there, and thought it might interest you. I happen to know, through my high-level personal connections in the industry, that this scene was filmed in Czechoslovakia, last month. My boss, who’s one of the script writers, sent me a picture of herself sitting at that desk, in the set replica of the Oval Office. Don’t rush to pencil in a viewing date, though. The thing apparently won’t be released until early 2021 — and that’s in Norway. Heaven knows when it’ll be available here. Sorry about not posting yesterday. That will happen from time to time, under the new regime. My schedule is not my own. Last week I got zero assignments. Null, as we say in Norwegian. In the resulting vacuum, I went a little nuts. I developed a sudden mania I’d never had before – I went out to lunch every day, sometimes to restaurants I’d never visited. I felt I needed to discover my options, up my dining game a little. It passed, thank goodness. I ain’t made of money. Yesterday a job came in – and, not surprisingly, it was a big one with a tight deadline. I always get a little nervous when I take one of those on, because I’m still uncertain of my powers. I live in terror of not meeting a deadline – causing my boss to fail to deliver on a contract, bringing the whole business down in ignominy. In fact, I’m better than I think, and I don’t generally have much trouble. I got this job done before I expected to. And today, another job and another tight deadline. But I finished the first draft before supper, and I’ll give it a polish this evening and send it off, so they’ll have it in Oslo when business starts tomorrow. No sweat. But I did sweat, a little. I’m a worrier. General observations on the Norwegian film industry from my perspective: I’d say 60 to 80% of my work is on scripts concerning spunky single mothers trying to make it in a man’s world. (Even the one I can tell you about, Atlantic Crossing, is about a woman raising her children alone – though she’s a princess without many career worries.) That scenario appears to be what they think people want to watch just now. I suppose it indicates that the bulk of the audience, both for movies and TV, is women. Which is probably true. But is it cause or effect? Not to say that these scripts are heavy with radical feminism or man-hatred. They’re generally pretty good in that regard. It just seems that the production companies want to see stories through women’s eyes. From Dr. Jackson Crawford, a list of introductory books for those interested in Viking studies. The list is deficient, of course, as it doesn’t mention my novels or Viking Legacy. Nevertheless it is not without value. “As an Irishman, I know what you mean,” I said. Baard slipped the cover back on the reliquary, and we went back out into the dark. You’d think that that revelation would be my chief memory of that night, but it pales in recollection, because of what followed. As we stepped back through the entry and into the hall, a figure filled my view, dark against the light, haloed like a saint in some eastern icon. She sidestepped right to let me pass, and I stepped left to let her pass, and so we did that foolish dance you do in narrow places, each trying to make way for the other. At last we both stopped and laughed, and by now I could see her face. It was the loveliest face I’d ever seen on human head. She was woman in her full bloom, but slender. A few strands of hair that peeked from under her headcloth were light brown, and her eyes – those eyes! I see them even now – large and blue under dark brows slightly curved. Her face was longer than an oval, rather triangular in shape to make room for those great eyes, and her lips were full, but not to excess. At that very moment I felt my stomach lurch, as if I’d stepped down a well in the dark. I closed my eyes and shook my head, fearing I’d eaten something bad and was about to shame myself before this woman, through being sick. The feeling passed. Then I looked back in her eyes, and my stomach went whump again. I looked away. All was steady. I was lost for words to say, but Baard moved up from behind me and broke the moment. Avaldsnes (Augvaldsness) today. 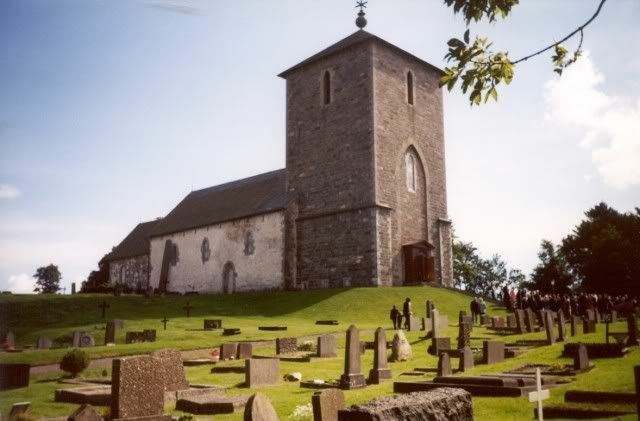 This church did not exist in Erling Skjalgsson’s time. I recall it as the night of two visions. One vision was for the land, the other for me. Together they marked a turning place. And neither was for the better. We were feasting at Augvaldsness. If God blessed our efforts, matters would now be less tangled in the land. Jarl Erik Haakonsson, with whom Erling Skjalgsson could never be at peace, had returned again to England to serve his lord, Prince Knut the Dane. This freed Erling to renew his friendship with Erik’s brother Jarl Svein, whom he rather liked. Svein sat now as lord of the north of the land, under Denmark. We were crowning their friendship by handfasting Erling’s son Aslak to Svein’s daughter Sigrid. The two were young, but such betrothals were common, and the young people liked each other well enough. Baard Ossursson, steward of Augvaldsness, was a man who liked his boiled pork. It was his habit to take a chunk from the platter in his big hand, squeeze it so the fat ran out between his fingers, and slurp the greasy runnels off as they oozed out. He was playing at that as we sat side by side, just to Erling’s right at the high table in the hall. Strangest new year of my life, I think. This one’s “driving me alee” (as I have a character say in my Work in Progress. I’m not even sure it’s a real nautical term). It’s not a bad new year. Quite the opposite, so far as I can tell. I’m having a good time. But it’s going too fast. A new year is a tug on the sleeve from Mortality, telling you, “You’re running out of time.” If my life were one of those rolls of receipt tape in a cash register, I’d be seeing the red borders they put on those things, down near the core, to warn you the roll is running out. It doesn’t mean the end is imminent. It would be wasteful to change the roll now. But it means you should check your supplies, to make sure you’ve got another roll ready, because The End Is Coming. The other day it occurred to me – I’m living the dream. All my life I’ve wanted to write from home for a living. And that’s what I’m doing now (translating is a form of writing, and one I enjoy). I don’t dread Mondays anymore – in fact, I prefer weekdays to weekends in this new dispensation. Which means the weeks whiz by. Back when I was toiling my way toward an ultimately useless master’s degree, I had one consolation – the slowdown of time. Einstein is famously supposed to have explained General Relativity by saying that a minute goes a lot faster when you’ve got a blonde in your lap than when you’re sitting on a hot stove. (Nonsense, I think. It’s true, but that’s a psychological and perceptional phenomenon. It has nothing to do – so far as I understand it – with Einsteinian relativity. Much evil has sprung from this error.) Those two-and-a-half years in the salt mines of academe felt like five to me. There was some satisfaction in that, at my time of life. Now, every week feels like a day. And I haven’t got that many weeks left. The solution, of course, is obvious. I need to suffer more.